Only soft lighting creates the right ambience on a balmy summer evening in the garden or on the balcony. Oil lamps like candles spread a very warm light, but in contrast to the waxy light sources, they also burn when it's windy. The lamps fuelled with oil were one of the main sources of artificial light over thousands of years. Today the oil lamp can be filled with a wide variety of aromatic oils, which provide the desired atmosphere in the garden or on the balcony. Designers combine oil and wick in a wide variety of covers. Discover diverse interpretations of the oil lamp in the Connox Interior Design Shop! The oil lamp consists of a container with oil and a wick. The wick transports the viscous fuel a few millimetres to upwards. You light the wick soaked in oil, the energy of the flame is transferred to the liquid film in the wick, it boils and begins to burn, which is in turn draws further fuel into the wick and brings it to the boil. If the fuel is running low, part of the wick burns up. As the oil in most oil lamps can be refilled and the wick replaced, you will be able to enjoy your new acquisition for a long time. Nowadays oil lamps are filled with paraffin. It is available commercially primarily under the term "Lamp oil". Some lamp oils contain fragrances that spread a pleasant smell when burned. You are spoilt for choice: originally a flat stone dish the classic oil lamp today is available in a wide variety of shapes, materials and colours. The Stelton oil lampwas named in Phaitons standard work as one of the best designs in the world. It consists of satin polished stainless steel or copper and clear or frosted glass and allows a look at the bright, friendly atmosphere of the flame. In addition to such a classic, there are more modern variants from Less 'n' more, mono, and Menu. The Bollard oil lamp from Skagerak returns, however, to the essential. It is reminiscent of bollards. 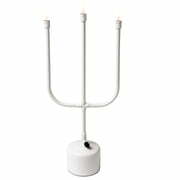 Who focuses on the classic candle, finds diverse design candle holders, Lanterns andtea light holders. You want to buy oil lamps online? Have your favourites delivered conveniently and within a few working days by us to your home!